For a brief introduction to quarter sessions see the first entry in this series. 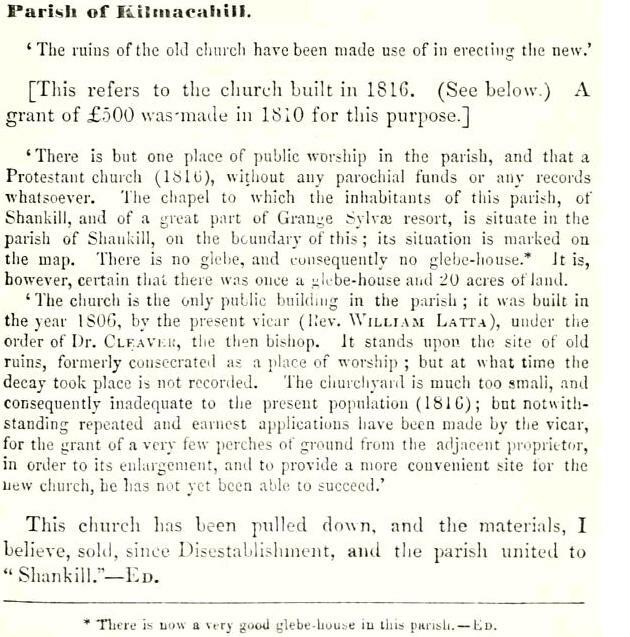 Spring 1839 – To Patrick Bridget, to repair for one year, 614 perches of the road from Castlecomer to Gowran, between Patrick Purcell’s house at Kellymount and the Widow Phelan’s at Garryduff; all in the townlands of Ballyvalden, Ballinvally, and Garryduff, at 1s 10d per perch. Author Unknown. 1832. 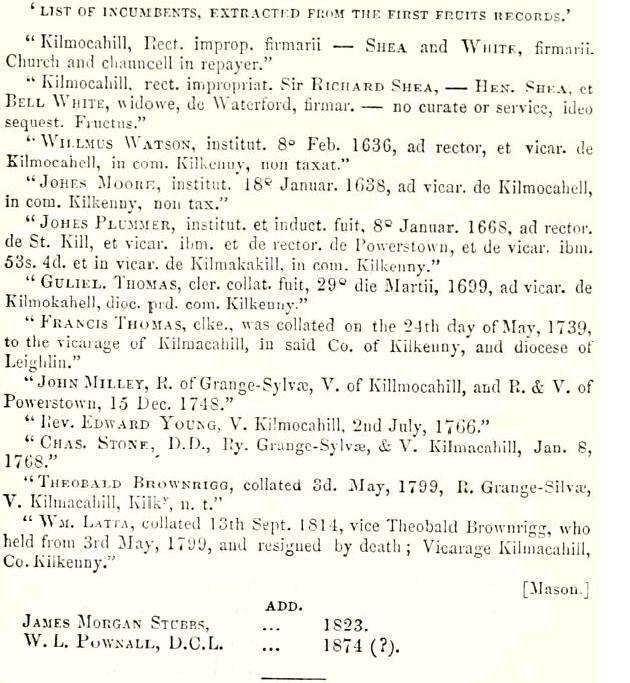 County of Kilkenny: General Assizes and General Gaol Delivery….Kilkenny: T. Shearman. Author Unknown. 1840. County of Kilkenny: General Assizes and General Gaol Delivery….Kilkenny: A Denroche Kilkenny Moderator Printing. Author Unknown. Year Unknown. County of Kilkenny: General Assizes and General Gaol Delivery….Kilkenny: A Denroche Kilkenny Moderator Printing. Spring 1832 – Thomas T. Bookey Esq., Of that part of the road from Goresbridge to Castlecomer, between the cross roads at Duninga and Michael Hughes’s house at Paulstown – 524 Irish perches at 5 ½ d. per perch. Spring 1832 – To Thomas T. Bookey Esq. the Rev. James Maher and James Brenan, to lower a hill and fill a hollow, at Ballyvalden, on the road from Castlecomer to Gowran, 21l. 4s. 4d., stamps 6s. 2d. Author Unknown. 1832. County of Kilkenny: General Assizes and General Gaol Delivery…. Kilkenny: T. Shearman. Quarter sessions were local courts that were usually held about four times each year. The courts did not have juries and were run by justices of the peace. Reilly outlines that justice of the peace were “a body of twenty three of the largest landholders in a county selected by the high sheriff in the spring and summer to meet with the crown’s circuit judges to present indictments for criminal charges and to serve as the financial body to impose the taxes for the repair of roads and bridges, the erections of courthouses and jails.” Below are the first series of road repair entries that mention places and people connected with the Paulstown area. The Association for the Preservation of the Memorials of the Dead in Ireland has one of the best names of any historical organization that is consulted for Irish genealogical research. It was in existence from 1888-1934 and published a journal in each year. The entry below comes from Volume II, covering the years 1892-1894. The history of the Protestant Church, as written in 1816, is outlined along with a list of rectors from the 17th – 19th centuries. Association for the Preservation of the Memorials of the Dead in Ireland. 1895. Journal of the Association for the Preservation of the Memorials of the Dead in Ireland. Volume II, 1892-1895. Dublin: Peter Roe.